In the far away land of Sugaria, where peppermint princes, knights in shining chocolate and other sugary delights delve, three girls one day encounter mysterious magical objects in the enchanted forests of Strawberry, Vanilla, and Chocolate woods. 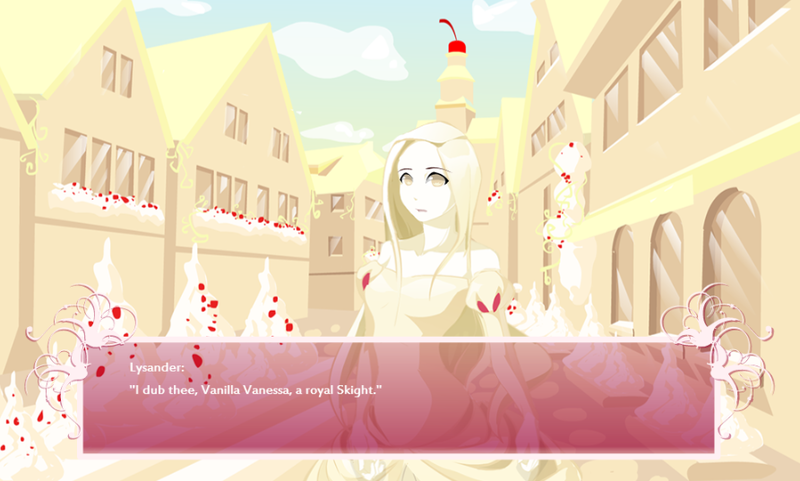 Decide their fate and destiny as they venture throughout the vast lands of Sugaria. 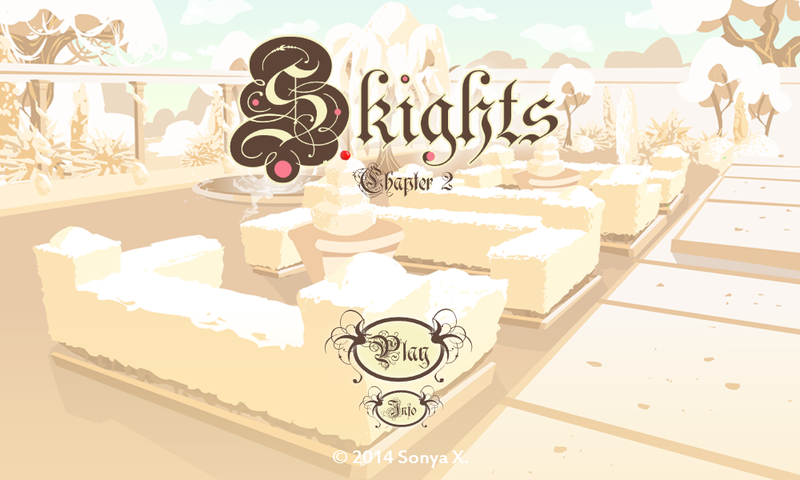 Skights II is the second episode in the Skights series. It features the servant girl from the Vanilla kingdom, Nessie. And I was really excited when I saw it posted on LSF, hahaha, since like I said in my first post about Skights, Nessie is my favorite character. Anyway, like the first Skights episode, I absolutely loved this, in all its beauty and cuteness! I really loved him back in the first Skights episode, but I'm starting to dislike him now, especially when I played Prince Lysander's path. He seems like a really insensitive guy. I mean, I thought he and Nessie were friends?! So why on Sugaria didn't he take her side? If they've been friends for so long, then he should have known that Nessie can't have done what those mean girls have been accusing her of. Plus I just don't like him. He seems to be hiding something evil. I am like an open book when it comes to myself, so I don't always appreciate people who hide their true self from others. Especially when they're hiding something bad. Like Colin. 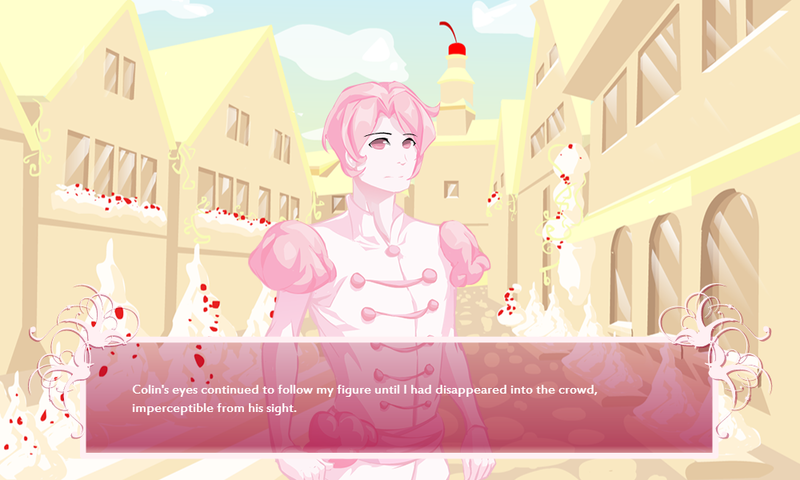 However, if you play Colin's route you'll see that he's a pretty sweet guy, even if he's such a jerk in PL's route. I still like PL better though, since he's still a nice guy even in Colin's path. I like those guys, the genuinely nice ones. Haha. I don't like it when they're just nice in their own path. Besides, Colin was hiding something even in his own path. Argh, the jerk is still a jerk. Ahh, another extremely squeal-worthy character. These guys are popping up like crazy nowadays, and I'm not complaining! Haha. Remember when I said yesterday that Peter from Rhyme or Reason made me squeal so much? 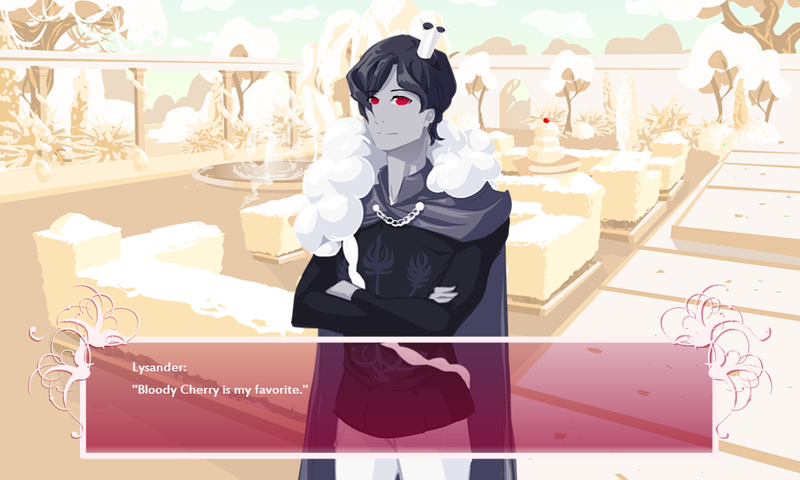 Well, Prince Lysander did too. 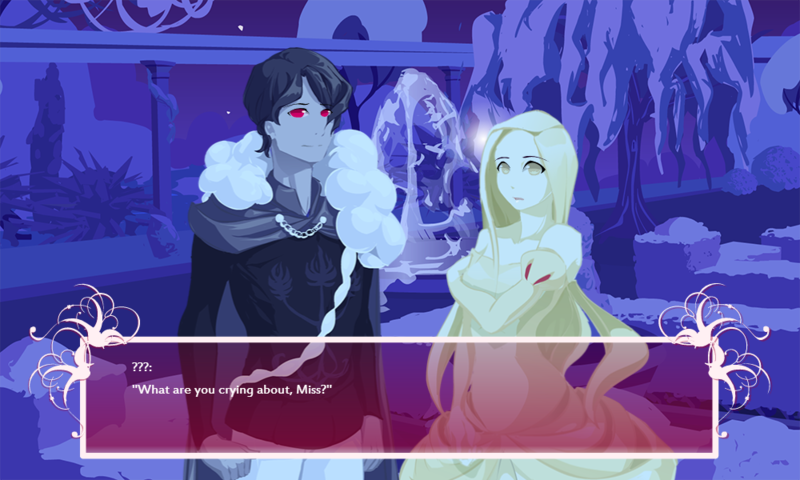 Aside from being a jet-black hottie with red eyes, he's also quite a gentleman, aside from the fact that he did say super harsh words to Nessie. I hope he doesn't turn out like Colin though. :3 Someone I liked before, who had turned into a jerk after a while. I mean, at least PL's words helped her a bit. + Of course, the awesome art is still there, as expected, hahaha, so I don't really think I need to mention it anymore. Still, I will, because the art is really wonderful. The backgrounds are just super lovely, I swear. + The story is still so beautifully hooking. 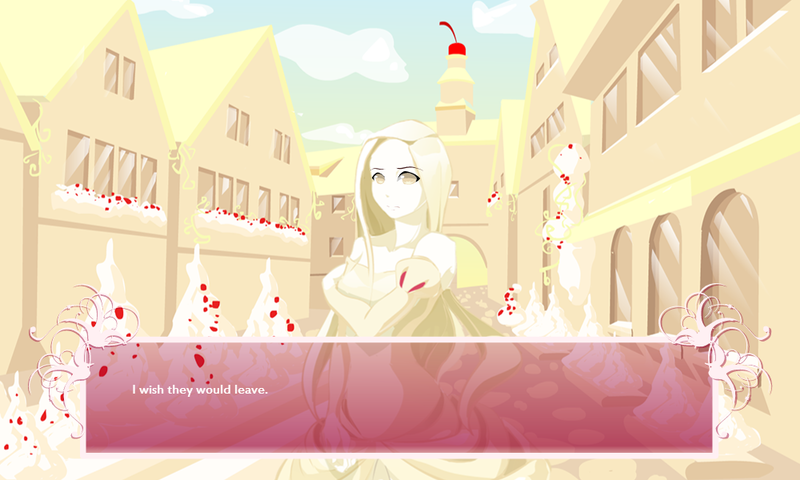 I couldn't stop reading, haha, even just to make notes for this visual novel. I mean, everything just falls into place, and I especially like how the story progresses. I seriously can't wait for the next episode. + Omg, SKIGHTS. Skights. My goodness, that was clever. Hahaha. This story is so deliciously good, I swear. Argh, hahaha, it's so awesome. :) This is why I love fairytale stories so much. - I found a pretty huge dislike for me in this episode. Actually, Skights II has two paths, Skights II-A and Skights II-B. You get Colin's path if you go for II-B, and you get both his and Prince Lysander's path if you go for II-A. So I realized... it that always how it's gonna be? You'll only choose the route you want? 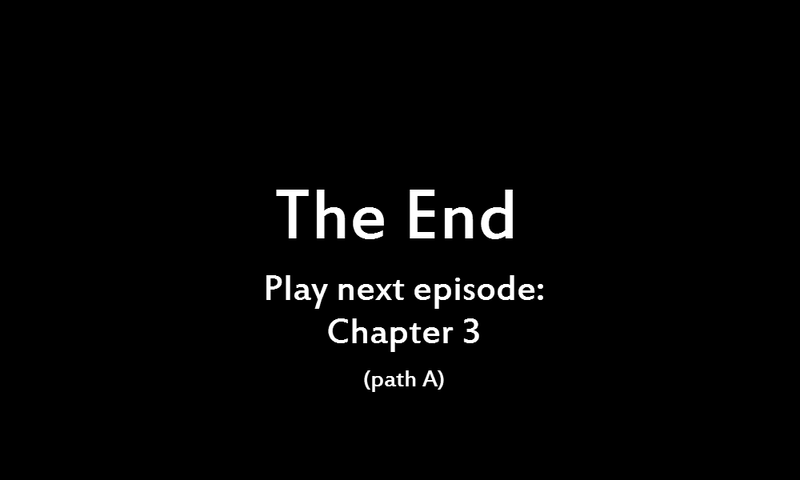 For this episode it's okay, because after the game, you're pointed to the next path. But what if the obtainables are not known yet, like with the other main characters? Does that mean you have to do an eenie-meenie-miney-mo on the paths? Or do they get no obtainable?! :o It's a pretty big problem for me as a reader, if you ask me. After all, the creator can't just always say, "Okay, this path is for this guy, and this path is for this guy." It takes away the element of surprise. Anyway, that's it! 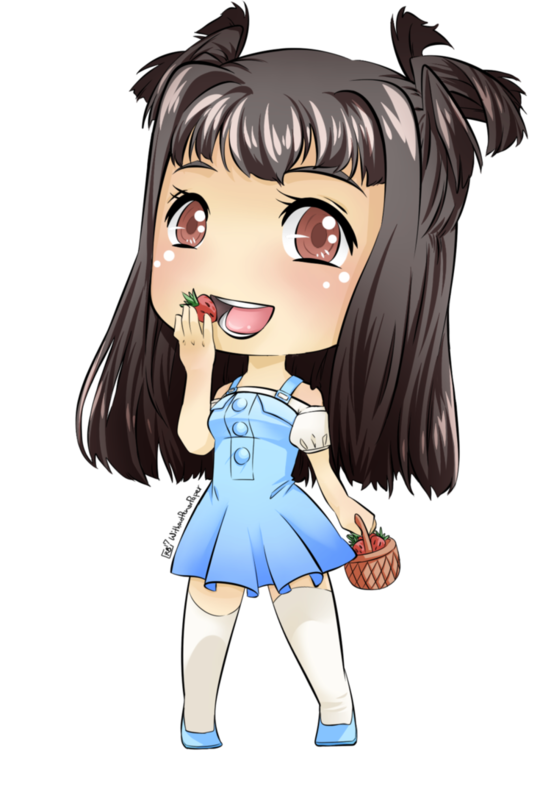 :) I give this 8/10 strawberries, which is... okay, higher than before, haha. But that's because most of my other gripes with the first episode have been smoothed out here, so... yeah. I'm not biased just because I like Nessie! Hahaha. This is seriously a better episode than before. 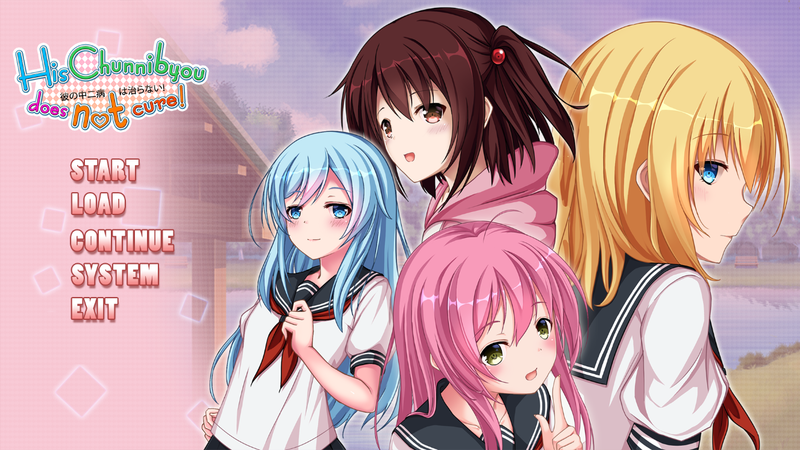 You can play this game online here, no download required. Oh, and that's Path A, the once containing both Colin and Prince Lysander's paths. I totally get what you mean by not liking Colin now that I've played the game... Your points are definitely valid and then there's the fact that dude you've known her most if not all of your life!!! How can you still not understand the type of person that she is!!! And even worse, in the garden scene... who the h*** does that guy think he is!! "Is that what you think" my foot! When have you ever given her a chance to believe differently when Hello?! You just stood up against her for her BULLIES and then called them beautiful right in front of her after accusing her of something you should KNOW she isn't the type to do... Especially when you've been calling other girls beautiful left and right in front of her and you've never once called her beautiful... Yeah suuuuuurrrreeeee it's ALLLLL her fault for not getting that through those actions you were actually declaring your undying love to her.... HA! Anyway... Sorry for the rant it's just, his character pushes more than just a few buttons and his actions just so happened to manage to get hit bulleye on all my pet peeves. 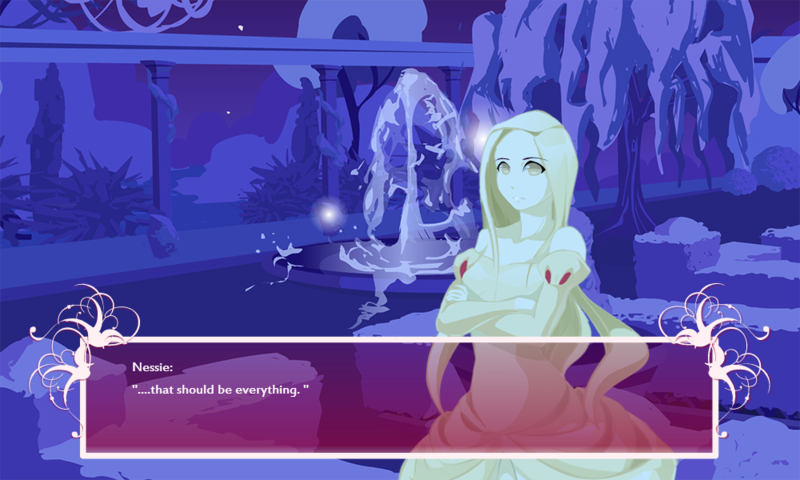 Plus the fact that the Prince, a virtual stranger is actually nicer to her and doesn't hold it against her when she lashed out... Yeah, Colin's definitely in my To-Kill-List right now.